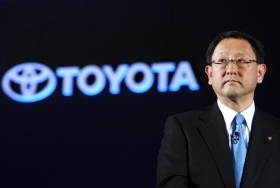 Under Chief Akio Toyoda, Toyota must still convince consumers its quality has recovered. WASHINGTON (Bloomberg) -- Toyota Motor Corp.'s rebound from record recalls that depressed sales and hurt its reputation for quality got a boost from a U.S. government report finding no link between electronics in the company's vehicles and sudden acceleration incidents. While the U.S. findings support Toyota's position that electronics played no part in its global recalls of more than 8 million autos for flaws linked to unintended acceleration and other defects, the company must still convince consumers its quality has recovered. The recalls triggered a 0.4 percent U.S. sales drop even as industrywide deliveries grew 11 percent last year, as well as hundreds of lawsuits and record federal fines. The findings don't change the fact that the recalled cars and trucks had flaws, said Rebecca Lindland, an analyst at IHS Automotive in Lexington, Massachusetts. NASA, the U.S. space agency, and the National Highway Traffic Safety Administration said their probe of possible electronics defects found no causes for unintended acceleration other than sticking accelerator pedals and floor mats that jammed the pedals. Those were the causes Toyota, the world's largest automaker, had identified. “We feel that Toyota vehicles are safe to drive,” U.S. Transportation Secretary Ray LaHood said in Washington. LaHood, who said in February 2010 Toyota owners should stop driving their recalled cars, said he later advised his daughter to buy a 2011 Toyota Sienna. She did. The study should “further reinforce confidence in the safety of Toyota and Lexus vehicles,” Steve St. Angelo, Toyota's chief quality officer for North America, said in a statement. Toyota will continue to cooperate with NHTSA and outside experts, he said. The 10-month review was the most definitive study by U.S. regulators since Toyota's Jan. 21, 2010 recall to fix gas pedals. That recall came after Toyota's late 2009 announcement of risks of floor mats jamming accelerators, contributing to its U.S. sales drop last year. Toyota paid U.S. fines totaling $48.8 million for the way it conducted some recalls, the largest such penalty for an automaker. The company also faces about 400 lawsuits alleging lost vehicle value, injury or death from sudden acceleration. Interbrand, a London-based market research firm, estimated this month that the cumulative impact of the recalls cut the value of Toyota's brand image by 16 percent in 2010 to $25.7 billion. It remains the most highly valued Japanese brand. “For people that may have been concerned about the brand, this is probably going to make them feel better about Toyota products,” said Jim Hall, principal of 2953 Analytics Inc., an automotive consulting firm in Birmingham, Mich. Almost half of the reports about unintended acceleration in Toyotas were sent to NHTSA in February and March 2010, when congressional hearings were held, NHTSA Deputy Administrator Ron Medford said. “We received the majority of those reports after Toyota began its recalls,” Medford said. The “vast majority” of complaints about Toyotas were at low speeds or when the vehicle was stationary, he said. In the last six months of 2010, NHTSA received about 2,200 consumer complaints related to unintended acceleration, said Olivia Alair, a spokeswoman for the agency. Just over 600 of those pertained to Toyota vehicles, she said. Product testers for Consumer Reports magazine, published by the non-profit group Consumers Union, began noticing a decline in fit, finish and materials quality in Toyota products in about 2007, said David Champion, director of automotive testing. NASA, at the request of NHTSA, which regulates auto safety, began a review in March of electronic throttle control systems in Toyota cars and trucks. The company underwent a series of U.S. congressional hearings, which included testimony from President Akio Toyoda on how the flaws occurred. NHTSA received 9,698 vehicle owner reports of unintended acceleration from 2000 to 2010, of which 3,054, or 31 percent, involved Toyota models, NASA said in the report. Complaints about Toyotas didn't increase after the company introduced electronic throttle control, starting with its 2002 model year Camry. NASA studied whether electromagnetic interference may have caused unintended acceleration, which may be linked to 89 deaths in 71 crashes since 2000, according to the auto-safety agency. NASA investigators used Chrysler Group LLC's test facility in Auburn Hills, Mich., for its vehicle testing work and bombarded vehicles with electromagnetic radiation, the Transportation Department said. Mechanical components were tested at NASA's Goddard Space Flight Center in Maryland.